Does AT&T Want Out of the iPhone Exclusivity Agreement? When the iPhone was first announced and tied to AT&T, industry ‘insiders’ projected the two companies to have an exclusivity agreement for up to five years. Since then, we’ve heard talks from major news outlets reporting that AT&T’s iPhone exclusivity ends in 2010. In April of last year, the Wall Street Journal was reporting that AT&T was pressing Apple to extend their exclusivity agreement into 2011. The most recent report from HotHardware claims AT&T’s exclusive rights to the iPhone in the U.S. will terminate on the 27th, citing an ‘inside source’. Different from others, they’re reporting that the iPhone has brought with it some bad press regarding the state of their network. As it’s been called by the WSJ, the “hummer of cellphones” has caused tremendous strain on the network in many major cities like New York and San Francisco. As these instances gain publicity, AT&T loses mindshare of those looking in and millions of dollars on ad campaigns defending itself from advertising attacks. During CES, AT&T announced a number of popular devices would be hitting its network this year. Among the handsets, they announced two WebOS devices would soon join their arsenal alongside five Android-based handsets within the first half of 2010. They also announced an “apps for all” program, which hopes to bring mobile applications to all its users, smart and dumbphones alike. Perhaps AT&T is preparing themselves for the end of their iPhone exclusivity by stacking their device lineup with some of the best smartphones to come. HotHardware’s report didn’t mention a specific carrier, unsure which Apple will partner with next. The most obvious for Apple would be Verizon since they’re the largest carrier, bringing the iPhone to tens of millions of potential customers. To bring the iPhone to any other U.S. carrier, Apple would have to manufacture a new model using CDMA technologies behind Sprint and Verizon or a model compatible with T-Mobile’s 1700 MHz 3G spectrum. Until now, we’ve only played with the idea that Apple would benefit from the iPhone’s multi-carrier strategy. Could AT&T benefit with the same strategy to ease their network? 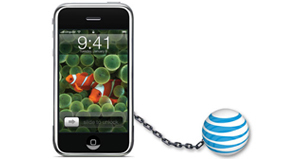 Will it happen this year or do you think AT&T will continue to fight for its exclusivity? Share your thoughts in the comments.